Desktop 3D printing gets real. Mcor Technologies Ltd is an innovative manufacturer of the world’s most affordable, full-color and eco-friendly 3D printers. 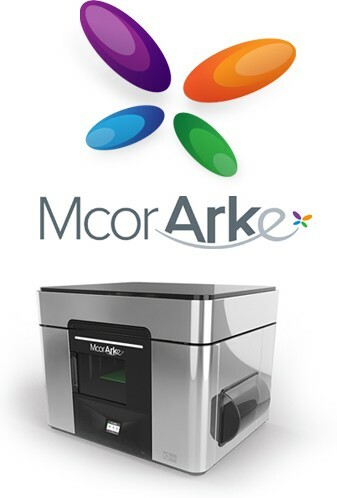 Mcor was looking to launch Mcor Arke, the world’s first full-color, desktop 3D printer. Mcor’s research indicated there was a large untapped audience of creative professionals who could benefit from a smaller, more affordable 3D printer that could print accurate, full-color models in an office environment. Until this time, desktop 3D printers were limited to single-color output. Only larger, expensive 3D printers could print full-color. Mcor felt that creative professionals would embrace 3D printing as a creative tool in the same way that users of Adobe applications see Adobe’s software as part of the creative process. 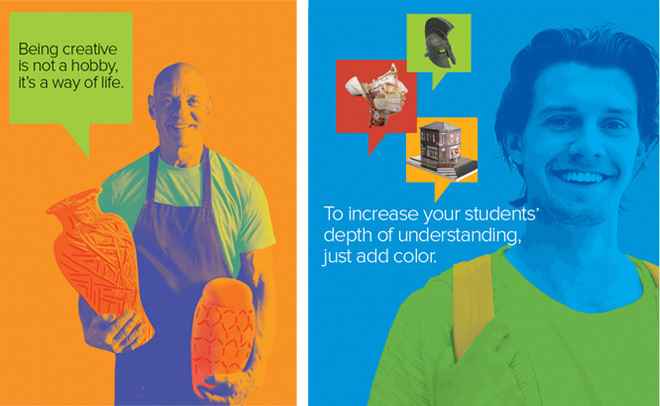 The challenge for Mcor was not only how to create a desktop-size 3D printer that could print in full color accurately and affordably, but also how to market it to creative professionals. 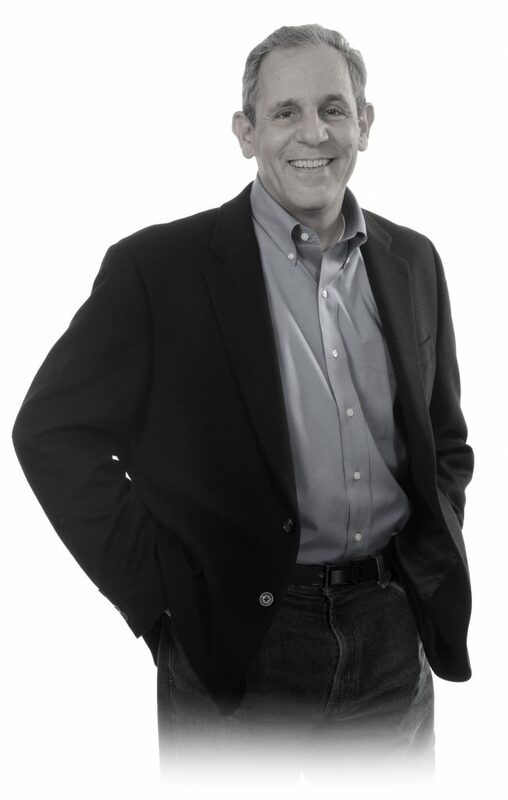 With the needs of creative professionals in mind, Mcor took a holistic approach to the development of Mcor Arke. Everything was on the table, from how the printer would operate to how it would look (e.g. Mcor realized that in a creative environment, one look doesn’t fit all, so Mcor Arke offers different colors and designs). When it came time to develop the brand design, a similar approach was applied: develop a product brand design that speaks about the creative process and to creative types. Because Mcor Arke is aimed at a different market than Mcor’s other commercial 3D printers, it should have its own brand design. This would allow us to speak directly to creative professionals. The brand design should be the antithesis of the competitors’. In terms of look, where their competitors’ are mostly black and white, Mcor Arke would be colorful. The language would be different as well. While competitors speak about product features and capabilities, Mcor Arke messaging will be inspirational and speak to the creative process. Another issue that needed to be addressed was making sure Mcor Arke would be pronounced correctly. The correct pronunciation is M-CORE ARK, but people could easily mispronounce ARK as AR-KEE or AR-KAY. We determined that the logo would be key in providing guidance on the correct pronunciation. And finally, since the corporate and product brands do not live exclusive of one another, Mcor’s current corporate brand design needed to be updated. This included the Mcor logo, which consisted of a mark followed by the name Mcor Technologies. The word “Technologies” labeled it as an engineering-driven company from another time, and the typeface was light and didn’t hold up well in some applications, particularly online. Develop a product brand design for Mcor Arke that inspires creative professionals to consider the potential of 3D printing in terms of their own work. The name Arke is derived from Greek mythology. Arke was the twin sister of Iris (the name of another Mcor full-color 3D printer), and was said to have iridescent wings. This was the inspiration for the wings that adorn the logo and make up the icon used in the software and on the touchscreen. The Mcor Arke logo is a real workhorse. First, by using the arc of the “e” to emphasize “ARK”. It indicates how to pronounce the name. The logo also features the colorful wings, which are also used as the “Create” icon in the software and on the touchscreen. I love the fact that every time someone presses the button to begin the process of building a model, they’re pressing the product icon. To me it suggests that the product and the creative process are one and the same.